Hi, and welcome to the Monday Buffalo Stamps and Stuff Idea. I saw this technique HERE. It's Gina K on her techniques network, so I thought I would give it a go. A close up of the distressed newspaper print. 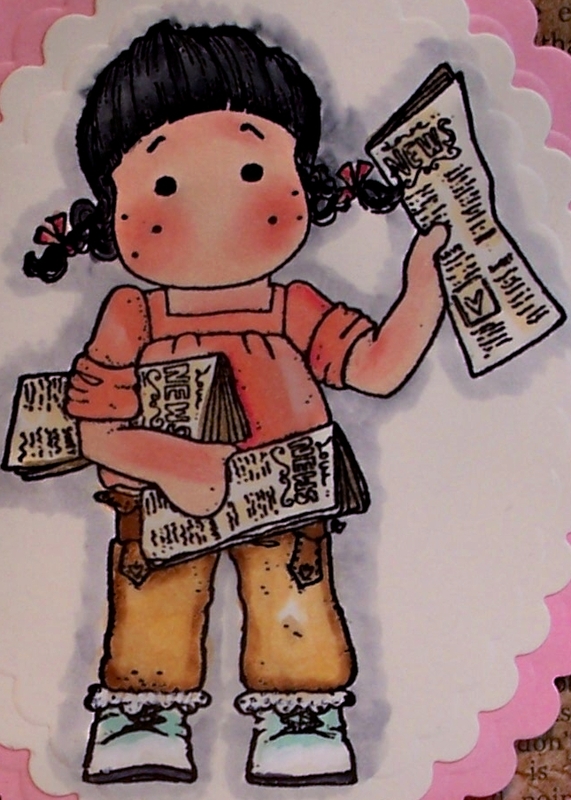 I had this super cute image of Tilda with the newspapers and it was just perfect for this project! I hadn't had a chance to ink her up yet, so this was the perfect card. 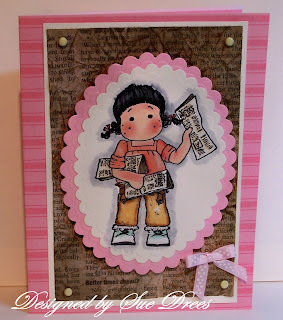 Kept the card simple to highlight the distressed newsprint. I colored Tilda with Copic Markers. I used ivory and pink card stock to make the nesties scalloped ovals with my Spellbinder dies. Added small plain brads and a tiny bow. It's a great technique to use on guy cards too, that's what you will see on the link to the video. Hope you have a chance to try this technique. Have a great Monday. I'm posting this a bit early because House Mouse and Friends Monday Challenge is having a blog hop beginning at 6 a.m. tomorrow so I didn't want this post to get lost. i love the newspaper distressing here. Fab work GF! and that magnolia image is too sweet. You color them beautifully.